Vehicle Tracking Market size was valued at over USD 6 billion in 2016 and is predicted to exhibit over 7% CAGR by 2024. Vehicle tracking market size is estimated to foster globally over the projected time frame owing to rising safety and security awareness, particularly in the corporate sector. Increasing need for monitoring the automobile movement carrying both passengers as well as goods will promote product adoption. Synergy between telecommunications and information technology has introduced next generation solutions in multiple sectors, enabling speed deliveries and improved efficiency. Increasing deployment of vehicle tracking devices by the transportation service providers to ensure fast movement of goods is primarily driving the GPS tracking industry size. Numerous benefits offered to the companies are discounts on insurance, safety of trucks & drivers, cost reduction, improved administration, employee management, better customer service, theft prevention, time management, and improved lifecycle management. Provision of various advantages is driving the market size over the forecast time frame. Multiple countries have guidelines on application, usage, and installation of fleet monitoring devices. Increasing automobile theft in countries such as Brazil, Russia, etc. is driving the regulations to be mandatory on the product usage. For instance, Brazilian government will start the mandatory installation of antitheft unit in all registered automobiles whether imported or produced. Substantial support for fleet monitoring systems may come from the rising sales of luxury and premium cars across the globe. Additionally, with increasing sales of commercial automobiles in developing countries the vehicle tracking market will gain higher momentum. Increasing investments in road up-gradation or constructing new ones will boost prospects for transportation via roadways, increasing the demand for GPS fleet tracking devices. Usage of these fleet monitoring devices may cause resentment among the drivers that their employer doesn’t trust them or may feel their privacy is invaded. These devices are expensive to be installed in each fleet coupled with cost of software and database maintenance. These factors may challenge the market to proliferate over the study period. 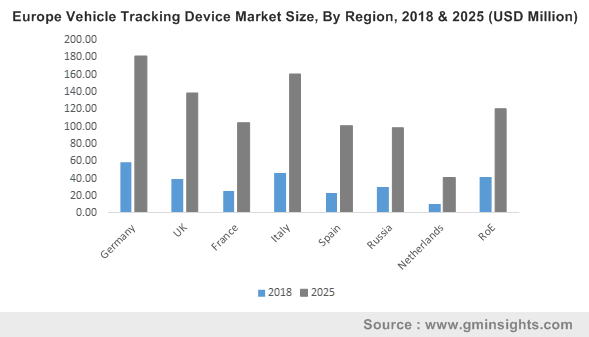 Wired vehicle tracking market volume share is estimated to surpass 92% by 2024 owing to rising deployment and advantages offered. Continuous innovations such as mobile tracking and enhanced satellite view are making the device to be primarily adopted by the customers for theft prevention. Moreover, wired devices are available at less cost as compared to the wireless units. Wireless vehicle tracking industry is predicted to generate over USD 2 billion over the forecast time span. This revenue generation can be attributed to compact size and easy portability solutions owing to battery powered operations among multiple locations. It may allow access to similar features as provided by the wired devices however has limited life. These are less likely to be adopted as can be easily removed by the driver thereby not serving the purpose. Vehicle tracking market from heavy-commercial vehicles will exhibit over 12% CAGR from 2017 and 2024. This growth can be attributed to increasing demand for transportation of goods and passengers together with rising construction activities across the globe. Increasing interest of customers in understanding fleet performance associated data and engine diagnosis is contributing significantly towards the segment revenue generation. Light commercial vehicles (LCVs) in the market are estimated to be valued more than USD 3 billion over the projected time span. This revenue generation can be credited to rising number of vehicles used for transportation of light weight goods such as courier service providers. Active vehicle tracking devices are forecast to dominate the industry volume share owing to its advantages offered in various applications. Benefits include real time monitoring, automatic reassignment, accurate delivery time information, labour law compliance, and versatile networks. Passive vehicle tracking units are less likely to be adopted owing to easy access by the driver to uninstall the product. It is anticipated to pose a CAGR of over 7.5% during the projected period. Increasing customer preferences towards easy and quick installation will drive the segment demand over the forecast timeline. Fleet management segment in the market will exhibit a substantial growth during the study period. The segment growth can be credited to benefits offered such as automobile safety, customer satisfaction, maximizing vehicle utilization, route planning, resource optimization, fuel monitoring, speed detection, and real-time monitoring. Vehicle tracking market extends further to logistics application and is predicted to be valued at over USD 2 billion by 2024. Advancements in mobile apps and mobile technology for logistics mobility are accelerating the industry size. Advanced units enable constant two-way communication with the fleet. Provision of lesser prices and easy availability may further influence the segment share. Asia Pacific vehicle tracking industry is projected to account for approximately 21% of the volume share by 2024. Increasing automotive production combined with forthcoming regulations in the region, particularly in emerging economies is improving the regional penetration rate. For instance, in April 2017, the Indian government passed regulation that public transport automobile with more than six seats of capacity will be installed with emergency buttons and tracking devices from 2018. North America is anticipated to dominate the global market over the study time frame. Presence of technology providers along with major automobile manufacturers across the region is boosting the regional industry size. Regulations such as the U.S. Code of Federal Regulations (CFR) and the Federal Motor Carrier Safety Administration (FMCSA) are contributing significantly in the overall business demand. Demand for fleet monitoring units across the globe is predicted to soar with increasing number of manufacturers over the forecast time span. 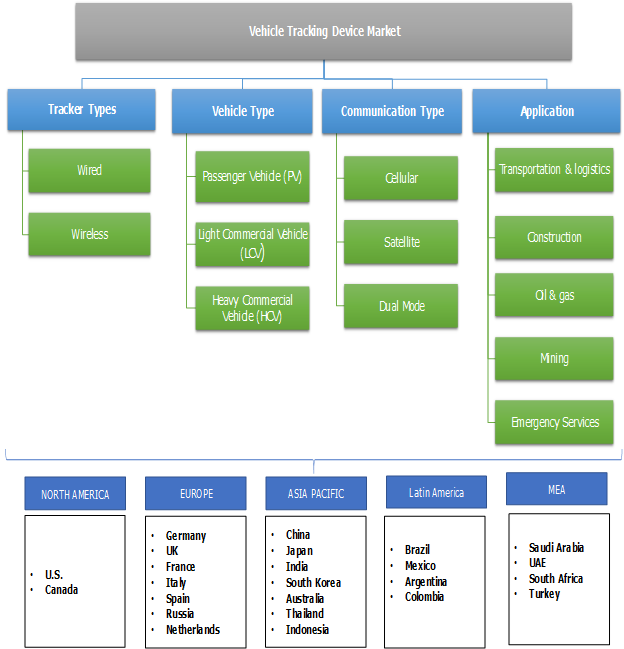 Vehicle tracking market participants are Calamp, Fleetistics, Garmin, Maestro Wireless Solutions Ltd., Mio, Navotar and Orbocomm. Industry players are focusing on improving the system penetration in the developing countries. The industry participants experience intense competition from local as well as international manufacturers. The online channel is witnessing high growth in the industry due to elimination of profit margin of the middle level distributors and offering proper service. Various online distributors are Matrix, GPS-Track, AVL View, TrackMe, India Mart, eBay, Amazon, Geek Buying, Snap Deal, Flipkart, Shopclues, Safekar, etc. Several market players are focusing on innovations along with mergers and acquisitions to improve their product line and enhance customer base. For instance, in March 2016, Navotar launched new website for enhancing fleet operations. Major product manufacturers have accepted online distribution channels for improving their product sales.